Is the winding פ in this sefer torah kosher? Leaving aside all other issues with the text as displayed, are the pehs acceptable, or do they actually need an inverted vav on the inside (instead of these whirls)? 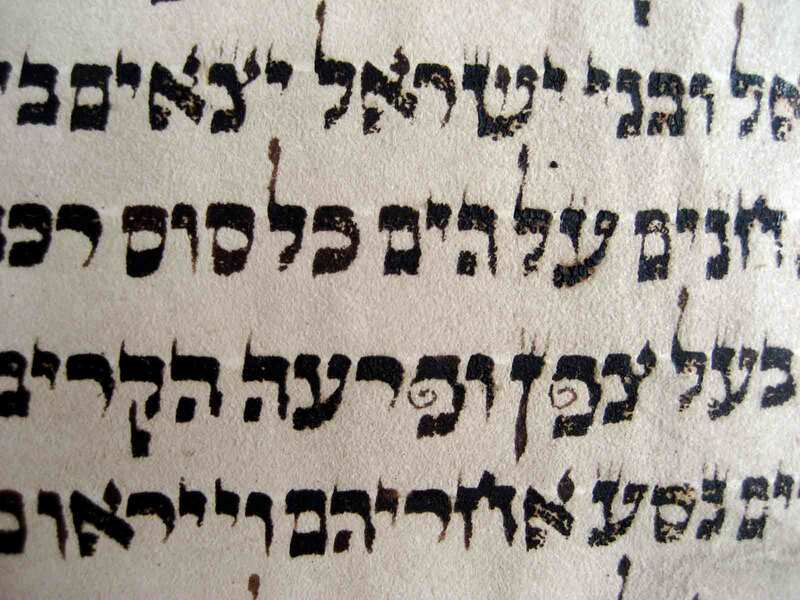 the big letters [such as the Bet in Bereishit], the little letters [such as the Alef in Vayikra], the dotted letters [such as the word Vayishakehu], the letters of different shape such as the winding Pe's [note this one is his example not mine], and the bent letters [such as the upside down Nun's], all in the manner which is passed down from scribe to scribe. I'll also add that sometimes we have traditions regarding letters that are hung above the line [such as the Nun in Menashe in Judges 18:30] and final form letters in the middle of a word [such as the mem sofit in Lemarbeh in Isaiah 9:6], not to mention various traditions regarding extra and missing taggin (the crowns above the letters) on certain letters. Why and how many of these traditions were lost in most communities is a question of history (and exile), but curly pe's definitely used to exist in specific places in Tanach and can still be seen in some very old Torahs. For more than you ever expected to read about these variant letters, see this chapter. I note that he doesn't seem to list the specific words in your picture as having uniquely shaped peh's, but I wouldn't be too worried as there are bound to be many different traditions in this matter. Israel Yevin says that "rolled up pe" (פ' לפופה) and other "curved letters" (אותיות עקומות) appear in Masoretic notes. He says "such forms were only used in a few MSS. The rolled up pe, for instance, is much used in Yemenite MSS." (Introduction to the Tiberian Masorah, p. 48). The Baal HaTurim is one of the more famous commentators to focus on the unique forms of certain Hebrew letters. All the variations have deep mystical meaning to the words with contain them. In addition to the examples above, there are letters that contain extra Tagin like the word L'Totafos in Veyahafta. First I looked up this passage its from Parshas B'halosecha 14.9-10. There was no mention of the "Rolled Pay" but as Double AA mentioned above, different traditions could be the case. The Baal HaTurim's commentary on the "Rolled Pay" can be found first in Parshas Ki Sisa 31.17 on the word וינפש, which he says is an allusion to the 2 souls we receive on Shabbos. The Baal HaTurim says (in other places Devarim 1.7 IIRC) that the reason why the pay written this way is that the word should really be written twice for emphasis or that its meaning represents a concept of doubling. 2 main sources of the Baal HaTurim are Sefer HaTagin and Machzor Vitri (which seems to simply republish Sefer HaTagin in the sefer. Sefer Tagin says there are 191 instances of the "Rolled Pay". These pays could very well be counted in the 191. I once heard a story from a Rabbi who lives in Tzfas and is a sofer. He said he once visited a sofer that has an entire room FILLED with Sifrei Torah. He opened one and say such beautiful amazing styles of writing letters. He asked the sofer why the variations suddenly stop in this Torah Scroll and the Sofer pointed around the room and said "See all these? My job is to remove all of this"
Note: This seems to be written in Ksav Beis Yosef which is the main ksav of Ashkenazi Communities. I thought it might be Vellish (Sephardic) but only Beit Yosef (Ashkenaz) writes the Tzaddik with the yud facing the left. Not the answer you're looking for? Browse other questions tagged aleph-bet-letters sefer-torah beshalach . What is the significance of this twirly pe? What became of Moshe's sons and their descendants? What scribal variations (decorations etc) have changed from the earliest sifrei torah until now? Can we teach reading Hebrew without using the full names of the letters and vowels? What's the significance of בי״ה שמ״ו סימן, espcially on Dt. 31:28? What is the reason for “stretched” letters in the Torah? Are there any halachot regarding the “atzei chayim” (wooden poles) placed on a Torah scroll? Why does ולירושלים start with a Vav? What can a shul do with unusable Torah scrolls?